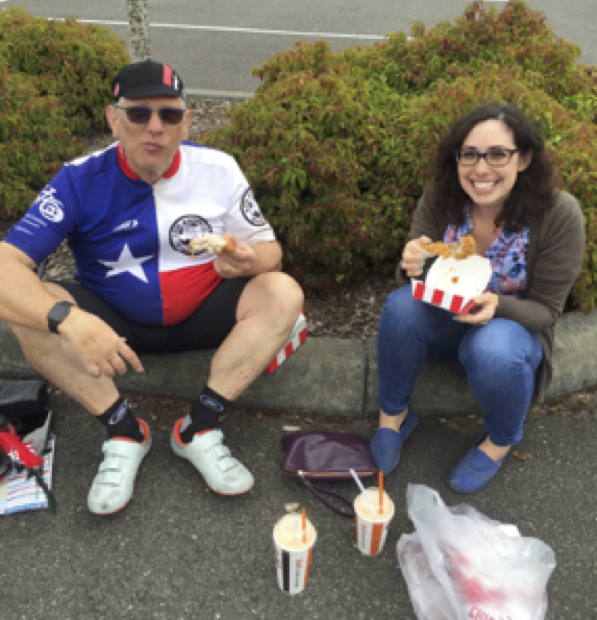 I began serious bike riding after participating in the 2015 Wheelmen picnic ride in which Bill Blackford rode with me for at least four hours to help me complete the ride! That experience prompted me to take the RS101 Bike Class, which really helped me get insight and riding suggestions. That was last fall. A business associate and friend of mine had a picture in his office of himself riding in the STP Event. Being a neophyte, I had no idea what the STP was. I learned that STP is an acronym for “Seattle To Portland,” a charity fundraiser for medical research and one of the most popular riding events in the country, with participation limited to 10,000 riders! The ride is exactly what it says - 200 miles from Seattle to Portland. The event is held each year on a weekend in the middle of July, with most participants riding a century each day. With the support of so many of you, I began riding two or three times a week and gradually over the winter and spring, me and my Fuji Gran Fondo 2.3 got into some kind of shape. Besides learning how to pedal, climb hills, endure heat stroke, cramps, and severe bruised ribs after taking a fall in my kitchen on wet tile, I felt ready in early July. While training, I had to work out the logistics issues – transporting my bike and accessories to Seattle and back. Not an easy task , breaking down the bike to ship to Seattle, building it there for the event, getting it back to Seattle from Portland to get it broken down again to ship home, and rebuilding it once back here! Whew! Surprisingly, I learned that the most economical and best way to ship the bike was to simply check it in as luggage on my flights. But again, all the breaking and building and shipping was not cheap. Then there was the accommodations in Seattle and Portland, and food and travel expenses. Definitely an event that needs to be planned and budgeted. I arrived in Seattle a couple of days before the event to acclimate myself to the weather, the air, and the terrain. The ride was well supported and had frequent rest stops. Seeing hundreds of various bikes and riders at stops was like being in a bike candy store! I was lucky to have a personal SAG vehicle with my wife and daughter giving me support. At one stop they surprised me with Kentucky Fried Chicken! Crazy, right! Here I am getting ready for a brief training ride. Bill lent me his San Antonio license plate. With my Wheelmen jersey and license plate, I was known as “The Texan” on the ride! Working a hill in the pack! As you can see, I was never alone. It was a comfortable ride knowing that all the riders understood the bike passing protocols and riding signals. My SAG driver, my daughter Elisa, partying with me! The halfway arch in Centralia, Washington. I had arrangedhotel accommodations but many riders made it a camp-out at the location. Towards the finish line. Notice that I was not even sweating in July! The weather was idyllic, in the lower ‘70s! Celebrating with an event badge. Next summer - Seattle to Vancouver?